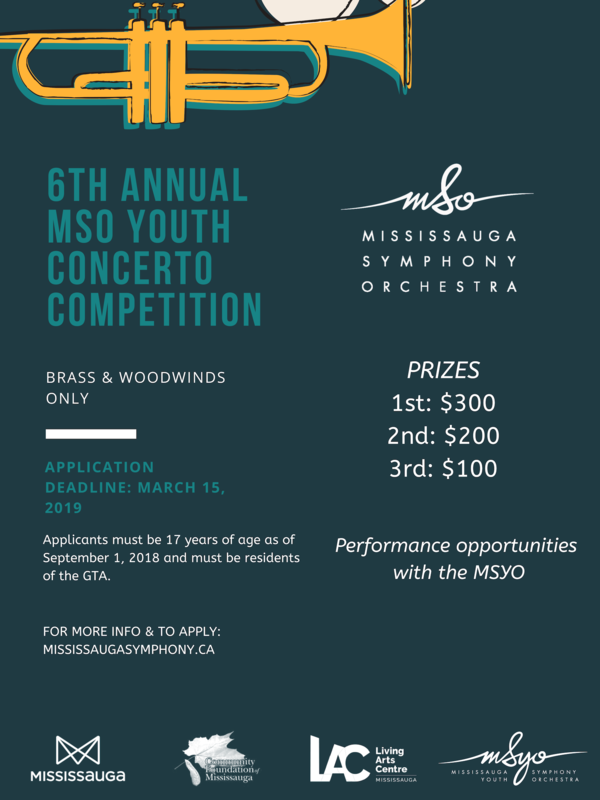 The Mississauga Symphony Orchestra’s annual youth concerto competition returns for a sixth year to provide fantastic opportunities for young musicians 17 years of age and younger to further their development in the field of solo performance. For the first time, the concerto competition will be open to woodwind and brass musicians only. Cash prizes and performance opportunities with the MSO and MSYO will be awarded to finalists. The Sixth Annual MSO Youth Concerto Competition would not be possible without the very generous support of the Community Foundation of Mississauga. One movement of a concerto, or a one movement work. Applicants must be 17 years of age or younger as of September 1, 2018 and must be residents of the GTA. Download and complete an application. The application form can be downloaded here. Record a video of your performance. Upload the video to YouTube. Submit the YouTube link and application form to: ryan.tobin@mississaugasymphony.ca. Live Audition (for those who advance): Saturday, June 3rd, 2019. The First Annual MSO Young Artist Competition is a fantastic opportunity for young musicians to further their development in the field of solo performance. Cash prizes and performance opportunities will be awarded to our finalists at the discretion of our panel of judges. Applicants must be 18-25 years of age as of September 1, 2018, and must be residents of the GTA. The Young Artist Competition will be open to woodwind and brass musicians only. Applicants must be 18-25 years of age as of September 1, 2018 and must be residents of the GTA. Download and complete an application form. The application form can be downloaded here.